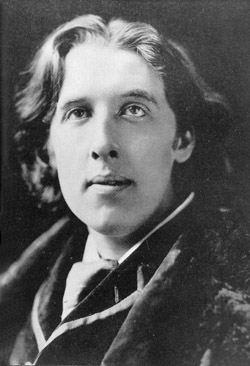 Oscar Wilde was a famous Dramatist from Ireland, who lived between October 16, 1854 and November 30, 1900. He became 46 years old. He was one of the most successful playwrights of late Victorian London there, and one of the most famous people of his time. He was known for his wit and his sharp comments, but his career was destroyed when he was sentenced to prison for "homosexual crimes". He is born under the zodiac libra, who is known for Balance, Justice, Truth, Beauty, Perfection. Our collection contains 166 quotes who is written / told by Oscar, under the main topics: Art, Dreams, Experience, Food, Forgiveness. "Men always want to be a woman's first love - women like to be a man's last romance"
"There is nothing in the world like the devotion of a married woman. It is a thing no married man knows anything about"
"All bad poetry springs from genuine feeling"
"A poet can survive everything but a misprint"
"Woman begins by resisting a man's advances and ends by blocking his retreat"
"There are only two kinds of people who are really fascinating - people who know absolutely everything, and people who know absolutely nothing"
"The basis of optimism is sheer terror"
"No woman should ever be quite accurate about her age. It looks so calculating"
"Life is far too important a thing ever to talk seriously about"
"Democracy means simply the bludgeoning of the people by the people for the people"
"Those whom the gods love grow young"
"One's real life is so often the life that one does not lead"
"One can survive everything, nowadays, except death, and live down everything except a good reputation"
"Now that the House of Commons is trying to become useful, it does a great deal of harm"
"I am the only person in the world I should like to know thoroughly"
"Women are made to be loved, not understood"
"There are many things that we would throw away if we were not afraid that others might pick them up"
"The critic has to educate the public; the artist has to educate the critic"
"Man can believe the impossible, but man can never believe the improbable"
"Life imitates art far more than art imitates Life"
"Do you really think it is weakness that yields to temptation? I tell you that there are terrible temptations which it requires strength, strength and courage to yield to"
"Consistency is the last refuge of the unimaginative"
"Children begin by loving their parents; after a time they judge them; rarely, if ever, do they forgive them"
"Women love us for our defects. If we have enough of them, they will forgive us everything, even our gigantic intellects"
"To lose one parent may be regarded as a misfortune; to lose both looks like carelessness"
"To expect the unexpected shows a thoroughly modern intellect"
"The advantage of the emotions is that they lead us astray"
"One of the many lessons that one learns in prison is, that things are what they are and will be what they will be"
"Nothing can cure the soul but the senses, just as nothing can cure the senses but the soul"
"Memory... is the diary that we all carry about with us"
"If you pretend to be good, the world takes you very seriously. If you pretend to be bad, it doesn't. Such is the astounding stupidity of optimism"
"If one could only teach the English how to talk, and the Irish how to listen, society here would be quite civilized"
"I choose my friends for their good looks, my acquaintances for their good characters, and my enemies for their intellects. A man cannot be too careful in the choice of his enemies"
"Charity creates a multitude of sins"
"The world is a stage, but the play is badly cast"
"Selfishness is not living as one wishes to live, it is asking others to live as one wishes to live"
"One should always play fairly when one has the winning cards"
"Laughter is not at all a bad beginning for a friendship, and it is far the best ending for one"
"I can stand brute force, but brute reason is quite unbearable. There is something unfair about its use. It is hitting below the intellect"
"Conversation about the weather is the last refuge of the unimaginative"
"Women are never disarmed by compliments. Men always are. That is the difference between the sexes"
"This suspense is terrible. I hope it will last"
"There is something terribly morbid in the modern sympathy with pain. One should sympathise with the colour, the beauty, the joy of life. The less said about life's sores the better"
"Man is a rational animal who always loses his temper when he is called upon to act in accordance with the dictates of reason"
"In America the young are always ready to give to those who are older than themselves the full benefits of their inexperience"
"In America the President reigns for four years, and Journalism governs forever and ever"
"Society exists only as a mental concept; in the real world there are only individuals"
"Deceiving others. That is what the world calls a romance"
"The well bred contradict other people. The wise contradict themselves"
"It is what you read when you don't have to that determines what you will be when you can't help it"
"If you are not too long, I will wait here for you all my life"
"Keep love in your heart. A life without it is like a sunless garden when the flowers are dead"
"Education is an admirable thing, but it is well to remember from time to time that nothing that is worth knowing can be taught"
"Why was I born with such contemporaries?" "While we look to the dramatist to give romance to realism, we ask of the actor to give realism to romance"
"Whenever people agree with me I always feel I must be wrong"
"Whenever a man does a thoroughly stupid thing, it is always from the noblest motives"
"When the gods wish to punish us they answer our prayers"
"When I was young I thought that money was the most important thing in life; now that I am old I know that it is"
"When good Americans die they go to Paris"
"When a man has once loved a woman he will do anything for her except continue to love her"
"What we have to do, what at any rate it is our duty to do, is to revive the old art of Lying"
"There is only one thing in life worse than being talked about, and that is not being talked about"
"There is only one class in the community that thinks more about money than the rich, and that is the poor. The poor can think of nothing else"
"There is nothing so difficult to marry as a large nose"
"There is no such thing as a moral or an immoral book. Books are well written, or badly written"
"There is no sin except stupidity"
"There is no necessity to separate the monarch from the mob; all authority is equally bad"
"There is always something ridiculous about the emotions of people whom one has ceased to love"
"There is always something infinitely mean about other people's tragedies"
"There is a luxury in self-reproach. When we blame ourselves we feel no one else has a right to blame us"
"The salesman knows nothing of what he is selling save that he is charging a great deal too much for it"
"The only way to get rid of temptation is to yield to it... I can resist everything but temptation"
"The only thing to do with good advice is to pass it on. It is never of any use to oneself"
"The one charm about marriage is that it makes a life of deception absolutely necessary for both parties"
"The old believe everything, the middle-aged suspect everything, the young know everything"
"The moment you think you understand a great work of art, it's dead for you"
"The man who can dominate a London dinner-table can dominate the world"
"The imagination imitates. It is the critical spirit that creates"
"The good ended happily, and the bad unhappily. That is what fiction means"
"Romance should never begin with sentiment. It should begin with science and end with a settlement"
"Ridicule is the tribute paid to the genius by the mediocrities"
"Quotation is a serviceable substitute for wit"
"Questions are never indiscreet, answers sometimes are"
"Pessimist: One who, when he has the choice of two evils, chooses both"
"Perhaps, after all, America never has been discovered. I myself would say that it had merely been detected"
"Patriotism is the virtue of the vicious"
"Our ambition should be to rule ourselves, the true kingdom for each one of us; and true progress is to know more, and be more, and to do more"
"Ordinary riches can be stolen; real riches cannot. In your soul are infinitely precious things that cannot be taken from you"
"Only the shallow know themselves"
"No object is so beautiful that, under certain conditions, it will not look ugly"
"No man is rich enough to buy back his past"
"No great artist ever sees things as they really are. If he did, he would cease to be an artist"
"Mr. Henry James writes fiction as if it were a painful duty"
"Most people die of a sort of creeping common sense, and discover when it is too late that the only things one never regrets are one's mistakes"
"Morality is simply the attitude we adopt towards people whom we personally dislike"
"Men marry because they are tired; women, because they are curious; both are disappointed"
"It is through art, and through art only, that we can realise our perfection"
"It is only the modern that ever becomes old-fashioned"
"It is only by not paying one's bills that one can hope to live in the memory of the commercial classes"
"It is only an auctioneer who can equally and impartially admire all schools of art"
"It is better to have a permanent income than to be fascinating"
"It is better to be beautiful than to be good. But... it is better to be good than to be ugly"
"It is always the unreadable that occurs"
"It is absurd to divide people into good and bad. People are either charming or tedious"
"It is a very sad thing that nowadays there is so little useless information"
"In modern life nothing produces such an effect as a good platitude. It makes the whole world kin"
"If one cannot enjoy reading a book over and over again, there is no use in reading it at all"
"I think that God, in creating man, somewhat overestimated his ability"
"I suppose society is wonderfully delightful. To be in it is merely a bore. But to be out of it is simply a tragedy"
"I sometimes think that God in creating man somewhat overestimated his ability"
"I see when men love women. They give them but a little of their lives. But women when they love give everything"
"I regard the theatre as the greatest of all art forms, the most immediate way in which a human being can share with another the sense of what it is to be a human being"
"I put all my genius into my life; I put only my talent into my works"
"I never travel without my diary. One should always have something sensational to read in the train"
"How can a woman be expected to be happy with a man who insists on treating her as if she were a perfectly normal human being"
"Hatred is blind, as well as love"
"Fathers should be neither seen nor heard. That is the only proper basis for family life"
"Fashion is a form of ugliness so intolerable that we have to alter it every six months"
"Everybody who is incapable of learning has taken to teaching"
"Every saint has a past and every sinner has a future"
"By giving us the opinions of the uneducated, journalism keeps us in touch with the ignorance of the community"
"Biography lends to death a new terror"
"Bigamy is having one wife too many. Monogamy is the same"
"Between men and women there is no friendship possible. There is passion, enmity, worship, love, but no friendship"
"As long as war is regarded as wicked, it will always have its fascination. When it is looked upon as vulgar, it will cease to be popular"
"As long as a woman can look ten years younger than her own daughter, she is perfectly satisfied"
"Arguments are to be avoided: they are always vulgar and often convincing"
"Arguments are extremely vulgar, for everyone in good society holds exactly the same opinion"
"Anybody can be good in the country. There are no temptations there"
"An idea that is not dangerous is unworthy of being called an idea at all"
"An excellent man; he has no enemies; and none of his friends like him"
"America is the only country that went from barbarism to decadence without civilization in between"
"Ambition is the last refuge of the failure"
"Ambition is the germ from which all growth of nobleness proceeds"
"All women become like their mothers. That is their tragedy. No man does. That's his"
"All art is quite useless"
"Alas, I am dying beyond my means"
"A man's face is his autobiography. A woman's face is her work of fiction"
"A man who does not think for himself does not think at all"
"A man can't be too careful in the choice of his enemies"
"A man can be happy with any woman, as long as he does not love her"
"A little sincerity is a dangerous thing, and a great deal of it is absolutely fatal"
"A gentleman is one who never hurts anyone's feelings unintentionally"
"He has no enemies, but is intensely disliked by his friends"
"Art is the most intense mode of individualism that the world has known"
"A work of art is the unique result of a unique temperament"
"A dreamer is one who can only find his way by moonlight, and his punishment is that he sees the dawn before the rest of the world"
"Experience is one thing you can't get for nothing"
"I want my food dead. Not sick, not dying, dead"
"The public is wonderfully tolerant. It forgives everything except genius"
"Always forgive your enemies - nothing annoys them so much"